• C E Ferulic + Ultra Facial Defense SPF50 C E Ferulic is a patented triple antioxidant serum for normal to dry skin. It is clinically proven to reduce wrinkles, increase firmness and brighten the skin’s complexion2. 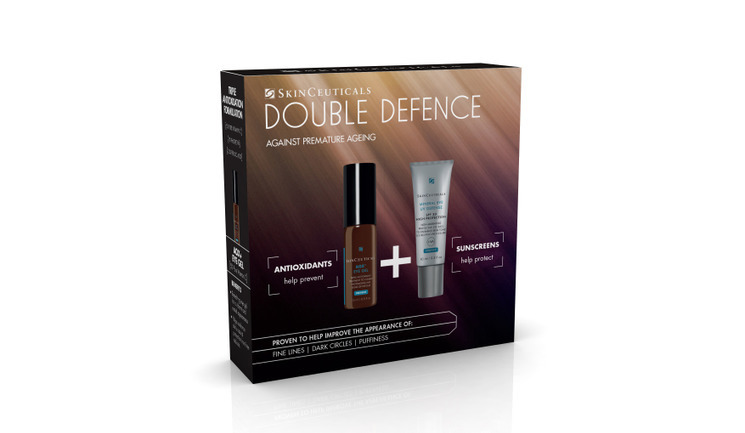 Ultra Facial Defense SPF50 is a daily use weightless moisturising sunscreen that delivers broad spectrum protection against harmful UVA and UVB rays which cause photoageing. • Phloretin CF + Brightening UV Defense SPF30 Phloretin CF is a triple antioxidant serum for combination to oily skin that improves uneven skin tone whilst reducing discolouration3. Brightening UV Defense SPF30 is a daily use lightweight sunscreen that provides broad spectrum protection against UVA and UVB rays whilst helping to even skin tone. • AOX+ Eye Gel + Mineral Eye UV Defense SPF30 AOX+ Eye Gel is a patented antioxidant formulated to protect the delicate eye area and to revive the look of the under-eye area, reducing the appearance of puffiness and dark circles. Mineral Eye UV Defense SPF30 is a tinted mineral based sunscreen especially formulated for daily use on the skin area around the eye. It provides high protection without migration or irritation whilst enhancing and nourishing the entire eye area.